No matter how much the revisionists of the 80s want to rewrite history, the 1960s was a truly revolutionary decade. If there was any doubt it would be dispelled by the knowledge that the two planets that symbolise revolution, Uranus and Pluto were in conjunction from 1963 to 68 for the first time for over a century. There were many iconic figures that were symbolic leaders of this revolution in the worlds of politics, art and music but few could be said to have had as much influence on the decade as John Lennon. Lennon was a complex character who contained lots of different traits many of them pulling in opposite directions. The fundamental theme of his life seems to be indicated by the opposition between his Libra Sun and Aries Ascendant. Libra is the one sign that wants and needs to live in harmony and balance with everyone but it is countered by the Aries Ascendant’s strong need to assert the individual self as a separate active entity. In a sense this opposition says much about the 60s decade itself. Sixties people wanted peace and love but also a strong individual freedom to do and say whatever they wanted. John Lennon wanted us to Give Peace a Chance but he also said that the Beatles were more popular than Jesus, a good example of the Libra Sun opposite the Aries Ascendant. But its an even better example of the emotional visionary with the Moon in radical Aquarius in the 11th house of political ideas in opposition to the self centred and egotistical Pluto in Leo in the 5th. 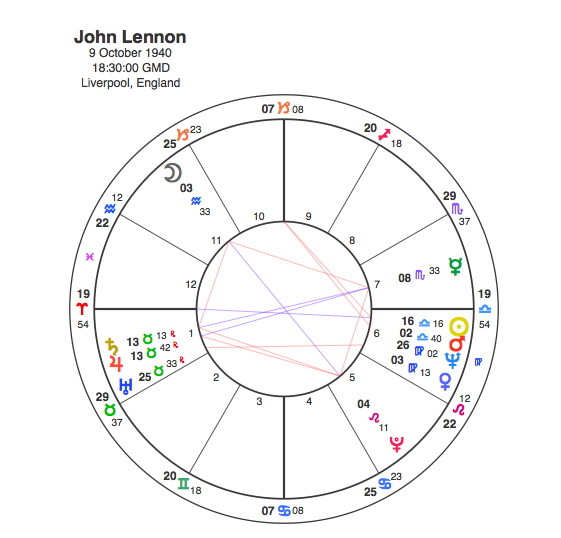 Lennon’s Moon / Pluto opposition was part of a Grand Cross pattern that also included Mercury in Scorpio and an exact Jupiter /Saturn conjunction in Taurus. But the focus of this article is not on John Lennon the political figure or the lead singer songwriter of the most influential pop group in history or the cultural icon, it is on his assassination. When a chart has two very distinct and powerful patterns and one of these contains Pluto, the small but lethal planet will have an even more drastic impact on the life of that person when it makes its transit to the other pattern. So when Pluto arrived at the conjunction to Lennon’s Sun and opposition to his Ascendant, the turning point in his life would be critical. In fact it was fatal, as Pluto was opposite Lennon’s ascendant when he was shot and killed by Mark Chapman in 1980. Chapman was a schizophrenic,who killed John Lennon just hours after getting his autograph. A Beatles fan since he was ten, he signed his name “John Lennon” at motels on his way to the murder. He had suffered bouts of depression and thoughts of suicide. He decided to go to Hawaii and kill himself but accepted his failed attempt as God’s will and attributed the orders to kill Lennon to God. In a strange way that sometimes happens between charts of people whose lives are powerfully karmically linked, both Chapman and Lennon have the Sun in exactly the same part of the chart in opposition to their Ascendant. The similarities end here as Chapman’s Sun / Ascendant opposition was part of one of the most difficult T Squares that Capricorn Research has come across although there is another chart in the collection that is very similar to Chapman’s and this character was also a schizophrenic. The opposition is from Taurus to Scorpio and this is the most intense of all possible opposite sign pairs. Saturn is also rising in Scorpio in opposition to the Sun and the tension between these points focuses onto an explosive apex Pluto at the very top of the chart. It describes a level of tension that cannot possibly be contained and its not that surprising that it resulted in killing someone. The question of who would be the target is answered by a second T square in Chapman’s chart. Chapman’s second T square was based on his Venus in Aries in the 5th house. His Venus was closely conjunct John Lennon’s Sun and exactly opposite his Ascendant. Because it was Venus, Chapman idolised Lennon who as a performer would definitely belong to the 5th house. Venus however is opposite Neptune, an aspect that suggests someone who is a fanatic rather than a mere fan and operating under delusions. 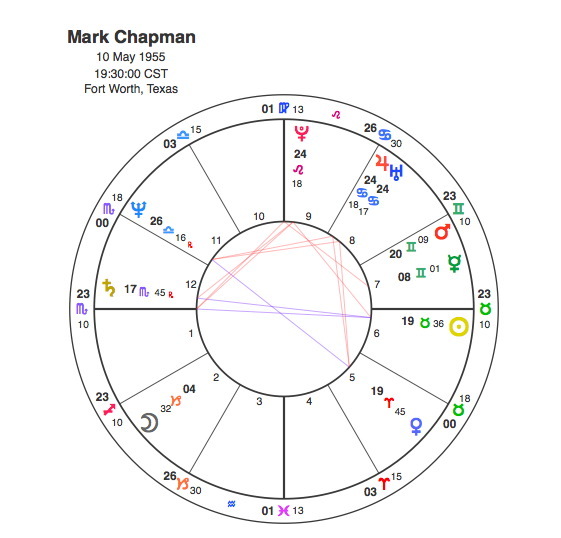 This opposition says it all, Chapman was obsessed with Lennon, the result of this obsession is seen by the tensions from the opposition being projected by T square onto an exact Jupiter / Uranus conjunction in the 8th house. This means the death ( 8th house ) of an immense ( Jupiter ) cultural icon for a revolutionary generation ( Uranus ). Mark Chapman shot and killed John Lennon on December 8th 1980. Pluto was in his T square in square to the Jupiter / Uranus conjunction in the 8th house at the time. It was a tragedy that was felt deeply by billions of people around the world, it was an act of insanity which felt like a nail in the coffin of the sixties, a decade of innocence that held John Lennon as its number one icon. In some ways it was strangely appropriate that this event should happen at the beginning of the decade that was so clearly the opposite, the 1980s.